The sequel to SoD Extreme is here! Starting development right after the first SoD Extreme was released, this mod once again takes advantage of the removal of all limits concerning sprites & guards. Next to that, we're introducing explosive barrels and some shootable objects in this one. Mapping is once again done by Ronwolf1705 & Dean. Hope you all enjoy the set! 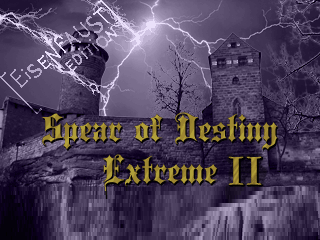 We proudly present Eisenfaust edition of SoD Extreme II. We've got many surprises for you - new enemies, weapons, features, enemy actions and attacks, while keeping the oldschool charm of the original release and of Wolf3D in general. Get Psyched! This edition started from us wanting to add to SoD Extreme II some of the features and enemies of our Eisenfaust mods (Eisenfaust: Legacy in particular) - hence the name. But then we kept adding ideas, and now changes cover many areas – including new enemies, weapons, features, enemy actions – to bring surprise and new twists to classic Wolf3D gameplay while keeping the oldschool/classic charm of the original SoD Extreme II. “Like ID should’ve done it” is overused but I can use it anyway in relation to this edition. Enemies are now more challenging and surprising, but you also have wider weapon selection. Have fun discovering all the new features, not all you meet right away. error occurs during the time i try to extract it with winzip. it wont let me do anything. i cant put the file ot desktop or anything. Try to use WinRar or 7Zip, both should work well. I downloaded the file myself now on another comp and it extracts and runs perfectly (used 7zip). I have enough feedback on the forums to know it's not a general issue with the files, just something on your side. Can't get this to run, what am I doing wrong? Don't know what to say, it's "unzip and run" kind of mod, it has all the files there. Try to re-download or use different unpacker. I downloaded the file myself now on another comp and it runs perfectly. I downloaded the file using Google Chrome also downloaded it using Microsoft Edge, same result - Unable to init SDL: No available video device. Plus I tried unpacking the file using 7 Zip instead of WinRAR and I also tried the latest version of WinRAR and still the same outcome ..... meh..
just level 14 why ??????????? ?